Want to know what makes our pizzas so deliciously special? Our authentic Italian recipes are made with third generation sourdough, founded 150 years ago in the home of pizza: Naples, Italy. That’s right, our starter dough is older than your Nonna. Italian type 00 flour (the finely-milled, superior stuff), water, Italian sea salt, olive oil and a whole lot of love are the simple ingredients that make up our light, crispy bases. They’re thrown up in the air a few times, generously topped and then placed in our stone bake pizza oven to create that unique taste. Our homemade tomato base with goats cheese, Fior di Latte mozzarella, cherry tomatoes, caramelised onions, a sprinkle of pancetta and a little bit of rocket & a dash of garlic. With every one of these pizzas bought, we will give £1 to Gabriella’s chosen charity. Young Minds improves the emotional wellbeing and mental health of children and young children as well as helping to tackle school stress. Each £5 that we donate pays for an information pack for anyone calling the parent’s helpline. Mozzarella, our homemade tomato base, nduja, spianata calabra, caramelised red onion, chilli oil. Fior di Latte Mozzarella, cherry tomatoes topped with sea salt, oregano, olive oil, bresaola, rocket and parmesan. Our homemade tomato base, Fior di Latte mozzarella, roasted peppers, chargrilled aubergines & courgettes. Fior di Latte Mozzarella, five cheese cream glaze, prosciutto San Daniele, caramelised red onion. Fior di Latte Mozzarella and tomato base with homemade spicy Italian sausage, pancetta, pepperoni, caramelised red onions. Fior di Latte Mozzarella, our homemade tomato base, Italian ham, mushrooms, pepperoni, artichokes, fresh basil. Fior di Latte Mozzarella, our homemade tomato base topped with our spicy pepperoni. Buffalo mozzarella, our homemade tomato base, taggiasca olives, rocket. All day and night, every Monday!! Lasagne like Nonna used to make. 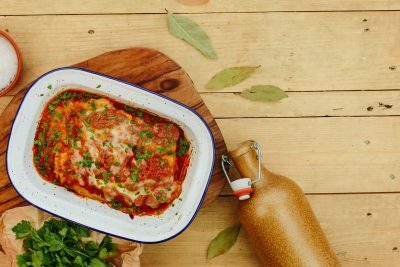 Layers upon layers of deliciously saucy beef, interspersed with lasagne sheets of pasta. There is plenty of veg nestled in our recipe, and it is all decorated in our homemade béchamel sauce. Served with a fresh green salad and our homemade dressing on the side. Layers upon layers of deliciously saucy vegetables, interspersed with lasagne sheets of pasta. And of course (just like the original), it is decorated with our homemade béchamel sauce. Served with a fresh green salad and our homemade dressing on the side. Homemade garlic butter smothered on top of one of our sourdough pizza bases. Homemade garlic butter and tomato on top of one of our sourdough pizza bases. Little extras on the side?